Chance is a probabilistic step-sequencer for Native Instruments Reaktor 5. It has a simple interface, that produces complex loops that never repeat. Use it to control other softsynths, hardware synths, fx and drum machines. 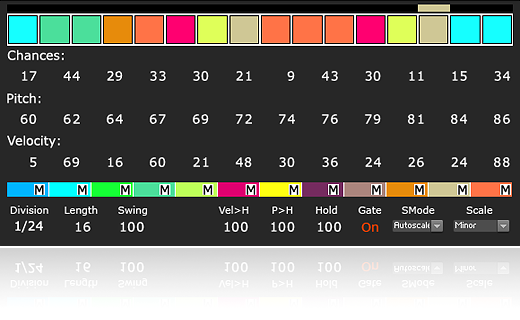 You have 12 colors (one octave) with individual Chance, MIDI Pitch and Velocity settings. When the probabilities are not the same, usually the color with greater chance is triggered.